This example shows how to acquire analog input data using non-blocking commands. This allows you to continue working in the MATLAB command window during the acquisition. This is called background acquisition. Use foreground acquisition to cause MATLAB to wait for the entire acquisition to complete before you can execute your next command. Learn more about foreground acquisition in Acquire Data Using NI Devices. Use the daq.createSession command to create a session. Add channel 0 from our NI 9205 with the ID of cDAQ1Mod1. Acquire 2000 scans per second for 5 seconds worth of data. Will run for 5 seconds (10000 scans) at 2000 scans/second. Use addlistener to add an anonymous function to the session. 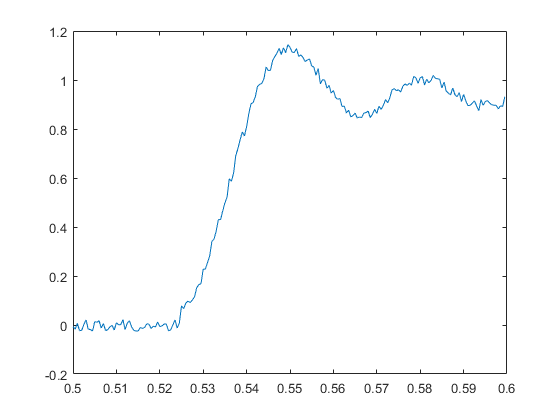 This function is called every time the DataAvailable event occurs, and plots the acquired data against time. By default this listener is called 10 times per second. The default rate that the listener is called is 10 times a second. However, you can change this my modifying the NotifyWhenDataAvailableExceeds property. The listener will be called when the number of points accumulated exceeds this value. In this case, we set it to 2000, which results in a frequency of once per second. After you add the listener, start the background acquisition. When you run this example in MATLAB a plot updates 10 times a second. In the published version of the example you see two snapshots of the plot: one, after the pause completes and the other at end of the acquisition. There are no other calculations to perform and the acquisition is set to run for the entire 5 seconds. Wait for the acquisition to complete. Call wait with no argument, which defaults to an infinite wait time. The wait command returns as soon as the background acquisition completes. Delete the listener so that it does not run with the next acquisition. In some cases there is no fixed time or number of scans to acquire. You may want to acquire continuously until a specific condition is met. 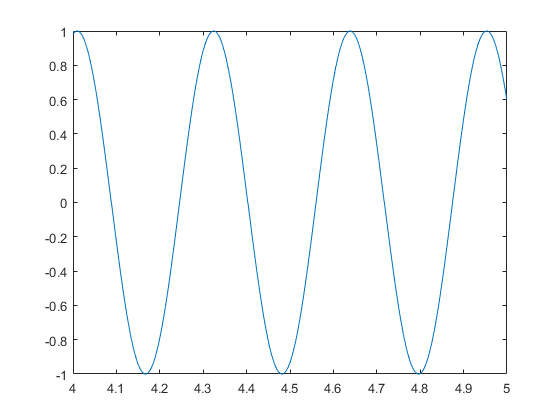 In this example, acquire until the signal exceeds 1V. Reset the rate at which the listener is called to the default of ten times per second by setting the IsNotifyWhenDataAvailableExceedsAuto property to true. Configure a new listener to process the incoming data. stopWhenExceedOneV is a multi-line function, stored in a separate MATLAB file. % Continuous acquisitions need to be stopped explicitly. Configure the session to acquire continuously. The listener detects the 1V event and calls stop. Use pause in a loop to monitor the number of scans acquired for the duration of the acquisition. Note that the output is mixed in with output from the event listener.